Daniil Volkov was born 1974 in Yalta, on the island of Crimea, the son of renowned Ukrainian artists with an ancestral history of painters going back to the court of Imperial Russia. In 1989 he entered the Crimean art school named after Samokish and it was here that he met his future wife Elena, also a distinguished artist. Graduated 1994. His first personal exhibition was held in Yalta in 1995. Further studies at Moscow State University in 1996. Returned to Yalta 2001 where he has been living and working since, specializing in capturing the beauty of the Crimean landscape in his own distinctive, lyrical style. Participant in numerous exhibitions, his works are in private collections in Ukraine, Russia, Europe and USA. Daniil's work is admired by both artist and collector alike, with many of his works being purchased by professional living and working artists around the world. We are honored to show his work and support his successful career as a fine artist. 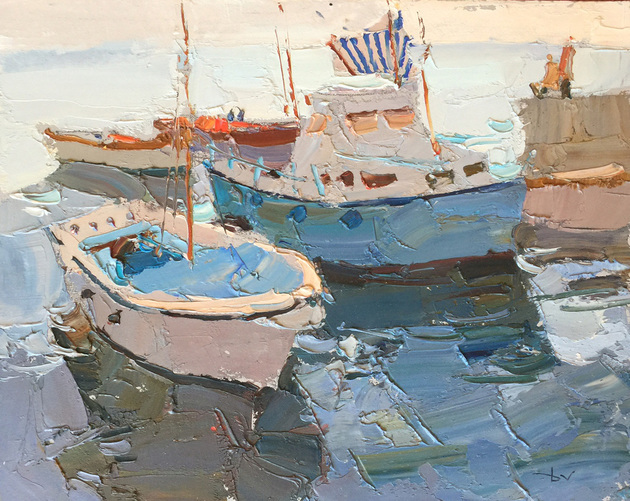 "Green Boat on the River"
"Old Blue at the Pier"
"Dinner on the Dock, Crimea"